A new pension self-assessment form for salaried GPs in England and Wales has been finalised by NHS Pensions working in collaboration with PCTs following advice provided by specialist accountancy firm Moore and Smalley. The purpose of the form, which doctors are obliged to complete and send to their PCT or LHB by 28th February 2011, is to collect all information on NHS pay earned by Type 2 medical practitioners during 2009/10. Type 2 doctors include salaried GPs formally employed by a practice, PCT or LHB, long-term fee based GPs working for a GP practice, salaried GPs working for an APMS contractor and GPs who work solely out-of-hours on either an employed or self-employed basis. Deborah Wood, healthcare services partner at Moore and Smalley and vice-chairman of the Association of Independent Specialist Medical Accountants (AISMA), says: “The form has been designed to ensure Type 2 GPs are paying the correct rate of tiered contributions on all their GP pensionable pay. The tiered contribution rules are complex and for salaried GPs with more than one post, completing the self-assessment form could prove particularly onerous.” AISMA is advising doctors to seek guidance from a specialist accountant. The new form and guidance notes can be found at www.nhsbsa.nhs.uk/pensions . Doctors wishing to contact their local AISMA accountant for further advice can find details here. Members of the Association of Independent Specialist Medical Accountants have reached their £15,000 fundraising target for independent humanitarian medical aid organisation Médecins Sans Frontières. 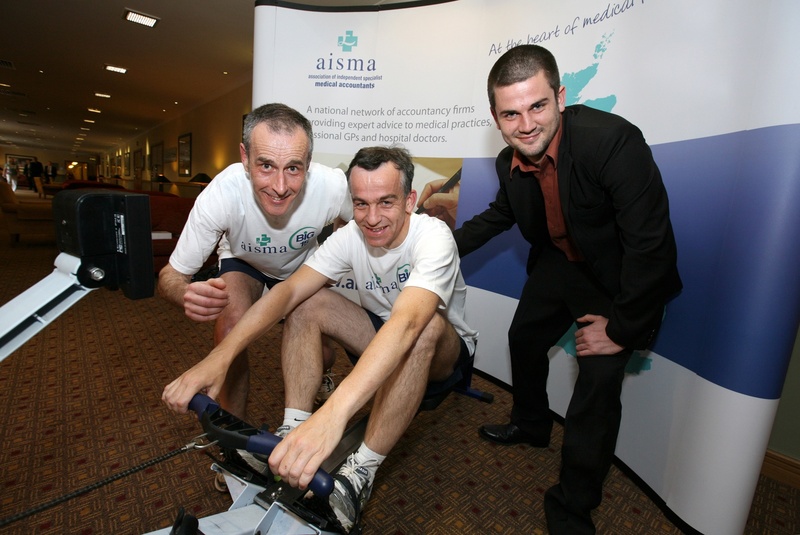 The AISMA Big 15 fundraising challenge, which has been taking place throughout 2010, celebrates the Association’s 15th anniversary and marks 15 years of high quality, specialist accounting services for the medical profession. AISMA accountants have been organising events throughout the UK, including a gruelling 15km indoor running and rowing challenge undertaken by committee members Luke Bennett and Andrew Johnson at AISMA’s annual conference in May. Other events included sponsored walks and bike rides, together with dress down days, cake sales and quiz nights. The funds raised by AISMA members will go directly to the Médecins Sans Frontières Amman project in Jordan where surgeons provide complex reconstructive surgery for Iraqi children suffering devastating injuries from the continuing violence across the border. Members of the Association of Independent Specialist Medical Accountants (AISMA) have appointed Bob Senior as their new chairman. He takes over from David Clough who stepped down at this month’s AISMA annual conference after leading the Association for eight years. Mr Senior, who is Director, Medical Services at accountants RSM Tenon, is a highly respected practitioner in the field of specialist medical accountancy. AISMA’s new Vice Chairman is Deborah Wood, head of Healthcare Services at accountants Moore and Smalley. Doctors wishing to contact their local AISMA member for accountancy advice can find details by clicking here. Members of the Association of Independent Specialist Medical Accountants (AISMA) have raised over £13,000 for independent humanitarian medical aid organisation Médecins Sans Frontières. The AISMA Big 15 fundraising challenge celebrates the Association’s 15th anniversary and marks 15 years of high quality, specialist accounting services for the medical profession. Sponsored events organised by AISMA accountants throughout the UK have included walking 15 miles, climbing the 15 Peaks, cycling 150 miles, shedding 15lbs, together with dress down days, cake sales and quiz nights. At AISMA’s annual conference, held at Eastwood Hall, Nottingham, on Thursday 13th May, Sam Knight, Digital Fundraising Officer, Médecins Sans Frontières joined AISMA accountants to cheer on committee members Luke Bennett and Andrew Johnson as they undertook a gruelling 15km indoor running and rowing challenge. Later Mr Knight spoke to the conference delegates about the work carried out by Médecins Sans Frontières in Amman, Jordan where surgeons provide complex reconstructive surgery for Iraqi children suffering devastating injuries from the continuing violence across the border. AISMA committee members Andrew Johnson (left) and Luke Bennett (centre) are joined by Sam Knight, Digital Fundraising Officer, Médecins Sans Frontières (right). Prepare accounts in a standard format ensuring that income and expenses are not netted off. If expenses are set against the income source rather than being shown separately, the true expense of running the practice will be understated. If these accounts are then used by the Review Board this will reduce the pay award. Compare your practice knowledgeably with other practices, both locally and at a national level. Be aware of what the accounts should look like and which expenses claims can be made to minimise Revenue enquiries. Understand what claims should be made and what income is expected and notify you if there are unexpected or missing figures. Keep abreast of material changes in NHS funding and warn you in advance of how these might affect your practice. Have systems to ensure an agreed timetable with you to turnaround the accounts (and if charging on a time basis, not charge you for general learning time) whilst waiting long enough to finalise accounts to ensure all income is correctly included. Understand the complications of VAT and dispensing practices. Have at least one other person fully up to date with medical accounts so you are not dependant on a single point of contact. Be able to help out on a temporary basis with the finance side of the practice if there is a gap between practice managers. Netting off income and expenses. Miscalculating debtors (amounts due for work done but not received), resulting in the risk of Revenue enquiries and income being allocated to the wrong partners (if there is a partner change from year to year). This also runs the risk of moving income into a higher tax bracket. Incorrect tax treatment of pension contributions paid or due to be paid, resulting in the wrong tax relief being applied. Incorrect completion of pension certificates, resulting in adverse affect on final pension payments. Allocating profits incorrectly, particularly regarding employer pension contributions, this can affect the balances due to or from partners. This often causes problems where one partner has left the NHS pension scheme. Miscalculating National Insurance contributions where there is a mix of self-employment and employment. Including income to which PAYE has been applied in the accounts, resulting in the income being taxed twice. Failing to show capital accounts and current accounts separately so that property ownership is confused. Neglecting to pre-share items of income that the partners draw as a prior share of profits (so partners’ current accounts become incorrect). Not understanding pension rules for locums – and incorporating their business without considering the cost of pension lost. Specialist medical accountants will also be able to provide access to other experts specialising in the medical profession, such as solicitors, valuers and advisers on VAT, capital allowances and independent financial planning, either in-house or through their own network of professional contacts.